Writing is not just about your shopping list; moreover it´s not always about the content; it can be an art. The living proof is Joyce; the head behind „Artsy Nibs,“ who makes every single word look like she has spent hours writing it. Maybe she didn´t spend hours writing but indeed she did spend a lot of time practicing writing; the art of calligraphy. 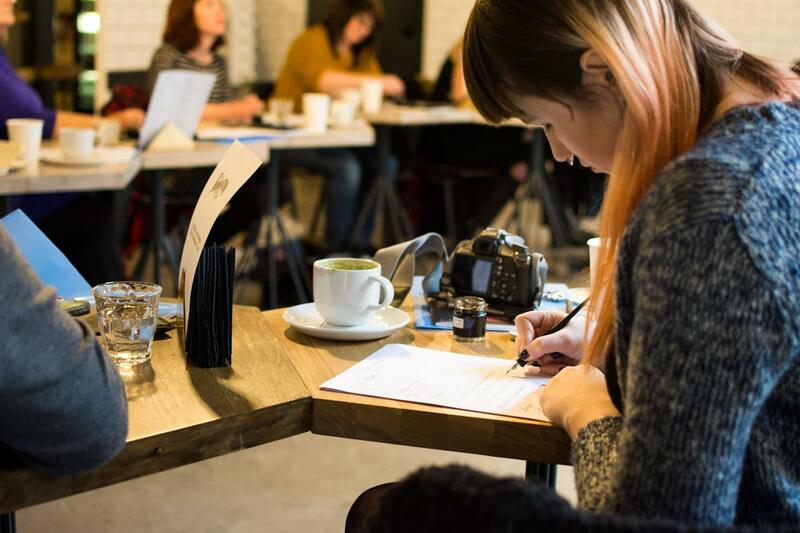 And because she wants to bring writing closer to people again she decided to hold calligraphy classes and I had the opportunity to take part in one of them last Saturday at one of my favourite Cafés; Foundation in Northern Quarter, Manchester. Joyce prepared lovely drawing pads for us, customized with our names and a little note saying practice makes perfect; two different types of nibs, a cute jar of walnut ink, a felt pen, a pencil, a ruler, a rubber and a cute little Christmas card made by her. Because Calligraphy is a lot of work, Foundation Café provided Sandwiches, Cake and some Coffees. Joyce explained the differences between modern and classic calligraphy to us and what faux calligraphy is. We also learned about the different materials and nibs you can use. After all the theorie we started practicing and god; I can tell you it was not easy. Especially at the start I had no idea where to put my arm let alone to write a single letter. After an hour I was getting there and I was rather proud of my first few decent looking words! 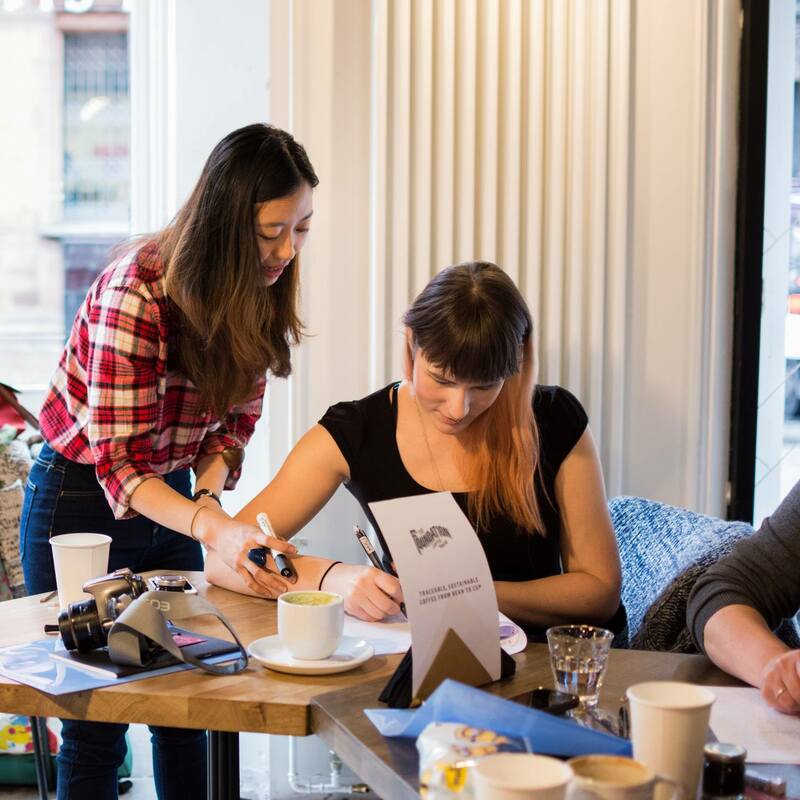 I learned so much at the workshop that I can´t wait for the next one AND my soon to come shopping trip to Aldous; my favourite Art supplies store in Manchester. Keep updated on my blog to find out whether me and my new nibs can actually make some Magic happen this Christmas! I would so do this! I remember learning calligraphy in elementary school, wish I kept it up! Looks like a really cool workshop to take. Nice photos! I would have loved that class. Thanks for this post--I found you on Google + and followed you a few places. Nice to meet you.